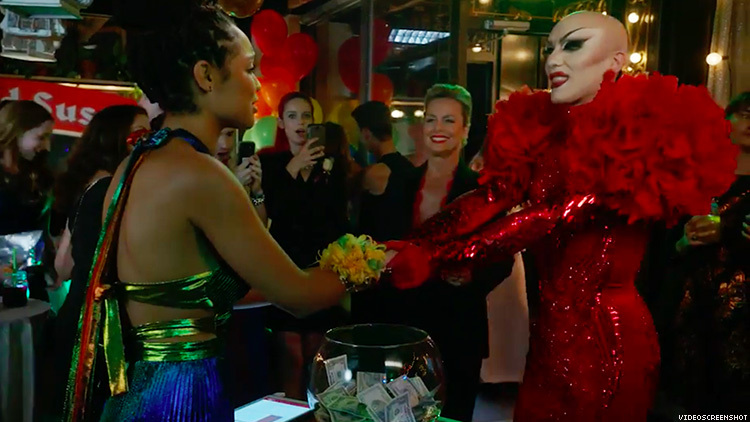 RuPaul’s Drag Race Season 9 winner Sasha Velour is coming to The Bold Type, Freeform’s series about best friends navigating career, life, and love while working at Cosmopolitan-esque magazine. And Aisha Dee, who plays Scarlet magazine’s bisexual social media guru Kat, could not be more excited about the guest spot. The episode that features Velour centers around a queer prom fundraiser Kat throws to try to save a beloved watering hole for queer women. In the episode, the bar crowd goes wild when Velour arrives at the prom on the arm of Scarlet's Editor-in-Chief Jacqueline (Melora Hardin). Dee also credits Velour with offering up some off-camera beauty secrets. “She gave me and my makeup artist some tips — how to set things and stop from being so shiny,” Dee says.